SAL DeTRAGLIA'S VIRTUAL TAPAS BAR: THAI ME UP, THAI ME DOWN. 1967 was the Summer of Love. Not a bad idea, but then again…you can’t eat love. It was with this critique in mind that María and I designated the period June through September 2004 as “The Summer of Thai Salads." This designation was not based on whimsy. It was, to the contrary, largely inspired by necessity. For starters, María dictatorially decreed several months ago that all Fat Sal dinners – from now until the end of time – shall be vegetarian. Or at least substantially vegetarian. This was a well-intentioned, if not well-received, idea. Having at least one veggie meal per day, she reckoned, would bring our family such health benefits as weight loss and cholesterol control. And to her credit, I can proudly say my weight is currently the same as it was in high school. That was also true before we started this diet, but why split hairs. But getting back to the point, this new diet posed a challenge for me as overlord of the family kitchen. There are only so many ways to fix vegetables before a crushing boredom forces one to look elsewhere for inspiration. And what better place to look for inspiration than to the east? After all, the people of Asia have hundreds – perhaps thousands – of unique ways to prepare vegetables; one or two of which might even meet with the approval of my sister. The second, equally compelling reason was the weather. This summer has been a scorcher in Cabanillas. As I type these words on a moistened keyboard, the temperature outside is 40 degrees Celsius. That’s 104 degrees Fahrenheit. What’s the best weapon against such stifling heat? Ben & Jerry’s “Chunky Monkey,” of course. But the second best weapon is the Thai salad. Light, citrusy, refreshing, and mercifully free of oil…Thai salads would be our saviour until the autumnal equinox. Indeed there are, but María and I consider Thai cuisine to be amongst the world’s best and most interesting. Thai food is loaded with fresh herbs and vegetables, uses small amounts of meat, and finds uses for coconut that even monkeys haven’t thought of. But the best thing about Thai food is its balance of flavors. Thais have taken the art of flavor balancing to extreme heights. It is common for a single dish to have sweet, sour, bitter, salty and picante flavors perfectly balanced and intermingled. Imagine your tongue as a trampoline, with each of these flavors bouncing about like perfectly sychronized acrobats; never colliding or toppling over the edge. That is the experience of eating a well-made Thai salad. Now that I’ve (hopefully) convinced you of the superiority of the Thai salad, let me tell you how to make one. We’ll break it down to two elements: the dressing, and the dressed. 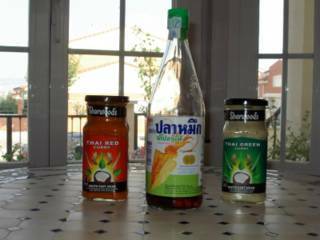 Thai salad dressing is simple to make. Its main components are 1 part fish sauce, 2 parts freshly squeezed lime juice, a few tablespoons of brown sugar and some chopped chile peppers (either fresh or dried). Simply heat the fish sauce, stir in the sugar until dissolved, cool, then whisk in the remaining ingredients. Does it sound fast and loose? It’s supposed to be…and don’t be shy about experimenting. Feel like something spicy tonight? Increase the amount of chiles. Got yourself a sweet tooth? Kick up the brown sugar. Does fish sauce give you a buzz? Add more. Can’t live without garlic? Mash a few cloves and toss ‘em in. Before moving on from the dressing element to the dressed, let’s take a moment to talk about fish sauce. Fish sauce is the most important ingredient in the Thai kitchen, but many non-Thais are unfamiliar with it. And of those who are familiar with it, many feel repulsed. Fish sauce is made by lining a large earthenware pot with alternating layers of salt and freshly caught anchovies. When the layers reach the top of the jar, they are covered with a woven bamboo mat and set in the sun to ferment for a year. The salted, fermented anchovies liquefy, and the liquid is drained from the jar, strained and bottled. The result is a thin, intense, amber-colored liquid that the Thais use as a flavoring in much the same manner as the Chinese use soy sauce. Sound disgusting? Just wait till you smell it. Fish sauce is not for the faint-hearted, but keep an open mind. When it is mixed with the proper ingredients, the result can be outrageously good. All Asian grocery stores (and many large supermarket chains) carry bottled Thai fish sauce. My favorite is Squid brand fish sauce. You will recognize it because it has a large, dry-looking squid on the label. There is no squid in the bottle; just on it. Such are the workings of the Asian marketing mind. Once the dressing is made, it’s time to fill the bowl with stuff to dress. This is the fun part. Thai salads lend themselves to fridge-clearing improvisation. When deciding what to toss into a Thai salad bowl, be sure to keep the “flavor triad” in mind. The flavor triad (as coined by an August 27, 2003 Washington Post article) is composed of three taste elements: sweet, sour and bitter. Each element of the triad must be equally represented. If one overpowers the other, then the salad will be unbalanced (i.e., too sweet or sour or bitter). Possible ingredients for the sweet category include red bell peppers, tomatoes, carrots, peaches, apples and sweet oranges. Candidates for the sour category include green mangos and papayas, sour oranges, granny smith apples, and lemon or lime wedges. Bitter ingredients include fresh herbs (especially cilantro, mint or parsley), grapefruit, orange and lemon zest, nuts and certain leafy greens. If you are feeling frisky, then toss in a bit of grilled meat or fish. Perhaps some pork chop, chicken breast, steak, shrimp or squid – cooled to room temperature and cut on a bias into thin strips. Then simply add the dressing, toss and that’s it. Time to open a bottle of wine and eat! Thanks, but I suspect that Pedro´s table manners are less than stellar. Better to wait for Queen Elizabeth´s next visit.